Most Americans are familiar with the dosing procedures of a pain killer like Tylenol or Aspirin. This familiarity allows them to self-medicate without speaking to a pharmacists, and to plan their pain relief according to their lifestyle. Few marijuana patients enjoy this security, though many of them desperately need it. Dosing is the most important aspect of any cannabis treatment program. Whether your intention is to combat a rising tolerance, maintain precise blood levels through microdosing, or control a changing pain level throughout the day, dosing is the variable which holds the key to success. Dosing is also one of the aspects of cannabis consumption that is the least understood. As lab quality cannabis products replace the dubious products of the cannabis fringe markets, the goal of reliable dosing has left the realms of eventual possibility and become something that even a casually educated home user can master. PLEASE NOTE: This guide discusses the dosing of activated THC after the flower has been decarboxylated, not raw cannabis flower. In the raw plant the THC is in its acid form, THCA. It must be properly decarbed to activate and utilize the THC. Learn more about decarboxylation here. The most accurate ways to know the chemical compounds present in your plant material is to send it away to be tested via HPLC. This time-intensive process can be done on as little of 0,1g of material of material. This is the testing procedure used by many cannabis producers, extractors, and manufacturers who must verify the content of their products before they are made available for sale. High Performance Liquid Chromatography (HPLC) is a method of compound analysis which can identify and quantify the individual elements found within a sample. It is currently the gold standard in all fields which make use of analytical chemistry, including the marijuana industry. Long term patients may be aware that HPLC replaced Gas Chromatography and Mass Spectrometry as the industry standard in cannabis lab testing. HPLC can identify both volatile and nonvolatile compounds present in a sample. Among other things, this makes it a more accurate testing method, which is particularly important in an industry where unknown pesticides are regularly discovered. This is the sort of testing procedure available at your local lab. We highly encourage patients to seek out their local labs and get their material tested, particularly if they regularly consume the same cannabis. There are various kits on the market which purport to produce reliable THC test results at home. We recommend MyDx. MyDx has many consumers and producers who swear by their results. Keep in mind that these tests do not meet the legal standard in most states if you are producing products for sale. We encourage patients to do their research and ensure that any lab they work with is using the most up-to-date testing procedures available. Most cannabis flower has a THC level between 10-20%, with the average strain grown under good conditions coming in around 15-17%. Kief and the related variations of hash tends to have a much greater THC percentage, coming in between 35-55%. Kief itself tends to be on the low end of this spectrum, while refined products like Bubble Hash tend to test towards the top. Concentrated extracts like shatter, budder, and rosin tend to have even higher THC concentrations between 60-80%. Note that blonder concentrates tend to be stronger than darker concentrates, and more translucent products like sap and rosin are often stronger than more opaque products like budder and wax. 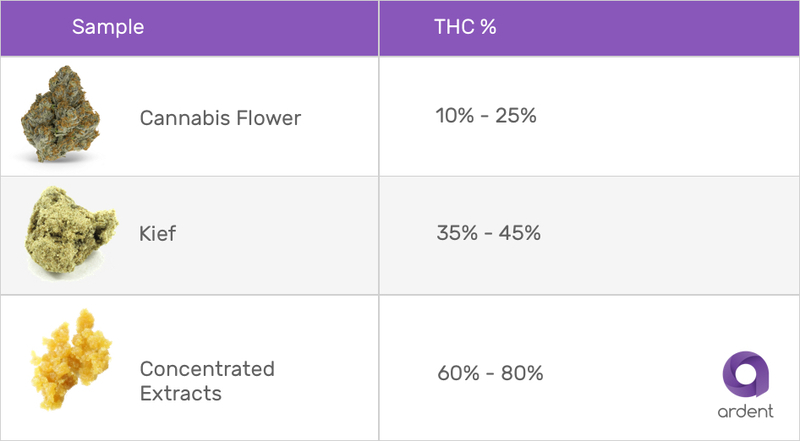 Once you know your THC %, we can do some simple math to calculate the mg of THC per gram. Many patients who medicate throughout the day do so with a THC dosage around 20 mg per dose. This dose would normally require a fairly high volume of cannabis if you are using imprecise decarboxylation or you are consuming your cannabis in inefficient ways. For example, it is estimated that upwards of 70% of available THC is lost in the process of smoking cannabis in joint form. With fully decarboxylated weed, a 20mg dose can be achieved with one tenth of a gram of cannabis (assuming the starting material has a THC concentration of 20%). This is a very small amount of material which is easily managed. This reduction in costs is life changing for patients who have previously needed to use large amounts to get the same results. At effective doses this small, it becomes easy to slip the cannabis into fun treats and regular meals, without ever having to worry about an overwhelming taste. Once you know the THC content of your material, proper dosing is as simple as weighing out the amount of plant material that contains the amount of THC you’re looking for. Long term cannabis patients who are new to the process of total decarboxylation will be stunned to realize how little plant material they can consume with this new potency. 100mg THC is a maximum dose size in many states where legal medical cannabis is sold. This amount is often spread across several cookies or candies. Because the Nova provides complete decarboxylation, there is no need for so much volume, even in baked goods. As always, the key to efficient dosing is total decarboxylation of whatever plant material you’ve chosen. Click here for more details on decarboxylation and the role it plays in efficient THC usage, or contact us directly if you have questions. We bought a second Ardent Decarboxylator! It works great! Glad you’re enjoying it – thanks for commenting! Shanel, nice job explaining a somewhat complicated process! It really is amazing at how little product one needs to achieve the desired effect. Saving my pennies for a NOVA! Thank you for clarifing this topic. I’m still aweful at math but this helped alot. Thank you. I ❤️ your mini teach-in’s! I have been using the Nova to decarb flowers since it first came out, and have been able to enjoy a precise amount for my use each time by the method you describe. It’s the best way to enjoy my meds. Thanks for this very informative piece. It cleared up many questions for me. While I probably won’t send samples to a lab, I will use your very helpful estimates. I usually employ a mix of “the bottom of the glass jar” materials and and generally know what the THC analysis is of the products I purchased. So, even though it’s a mix of varieties and, decarboxylated with your device…I’m a getting good eye for the measurements I should use. weigh and eat it with my breakfast or lunch take it with my daily vitamins (I call vitamin C+). Get one, you’ll love it too. thanks Ardent. My life has changed since trying Ardent Lift. I am truly elated with the performance of this product. Thank God for Shanel’s experiences, determination and caring enough to spread the necessity of transforming health and wellness at an affordable price for everyone. Just thought I’d let you know how great the Nova is! I have had one for almost two years now and swear by its efficacy! Just vaping or smoking the decarboxylated cannabis is so much more potent after a pass in your miraculous machine! I haven’t tried sublingual dosing yet, but intend to do so very soon. Thanks again for making such a break-through product!